DNA sequencing and intensified field work have contributed towards a much improved understanding of Australian orchid systematics. Great progress has been made in discerning monophyletic groups or clades. Fresh interpretations of morphological evolution have been made possible by comparisons with the results of DNA analyses. Significant conceptual shifts from polymorphic species concepts to biological and phylogenetic concepts have also elevated the discovery and description of new species. Consequently, over the past decade, the number of Australian orchid species recognized by taxonomists has risen from approx. 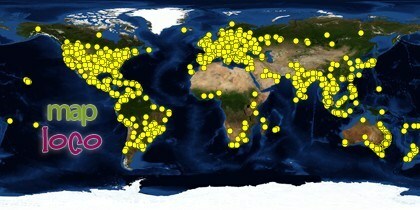 900 to 1200. Similarly, the number of genera recognized by some taxonomists has increased from 110 to 192, resulting in 45% of Australian species/subspecies being assigned a new generic epithet since 2000. At higher taxonomic levels, much of the recent controversy in Australian orchid systematics reflects a divergence in views about where to split and assign formal names within unequivocally monophyletic groups. The Dendrobiums are not immune from the various rifts and shifts in taxonomy and phylogenetics, not even an iconic one that is named after a town and then chosen from competing candidates to be the definitive emblem for an entire state of a nation. Variously referred to as Dendrobium bigibbum, Dendrobium phalaenopsis, Dendrobium bigibbum var. phalaenopsis, Dendrobium bigibbum var. superbum, Dendrobium bigibbum subvar. superbum, Dendrobium bigibbum var. bigibbum, Dendrobium bigibbum var. compactum, Vappodes bigibbum, and Vappodes phalaenopsis, the floral emblem of the state of Queensland in Australia, commonly called the Cooktown Orchid, has been caught in the taxonomic turmoil and crossfire, for better or worse. Existing or outstanding naming discrepancies in paperwork, registries and historical documents are abundant. Similarly, should one stick to Dendrobium teretifolium or stand by Dockrillia teretifolia? Ought one to promote Dendrobium smillieae and demote Coelandria smillieae, or vice versa? The recent 2014 G-20 Brisbane Summit was the 9th meeting of the G-20 heads of government. 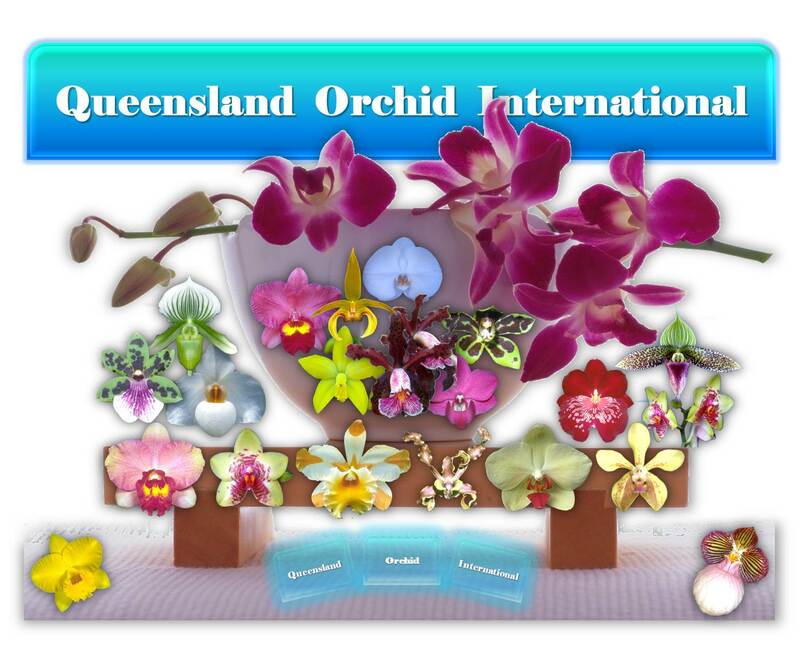 It was held on 15–16 November 2014 in Brisbane, the capital city of Queensland, the only state in Australia whose floral emblem is an orchid. Endearingly known as the “Cookie”, this historically significant orchid is still recognised by many as Dendrobium bigibbum for the moment, even though there have been reclassifications at both the genus and species levels. If the name Vappodes phalaenopsis were to be accepted, then it would indicate that the orchid is neither a true Dendrobium nor a real Phalaenopsis. The scientific title Vappodes originates from the Greek word vappo, meaning a moth or butterfly. The elided suffix -odes, meaning “similar to”, is a reference to the appearance of the flowers. Figuratively speaking, certain scientists (or botanical detectives) have been trying to sample, stir, shake and spice up the “Cookie” complex, as well as carving up their credentials and territories via a series of associative and comparative processes to determine the ingredients or pedigrees of the “Cookie” complex evermore precisely. 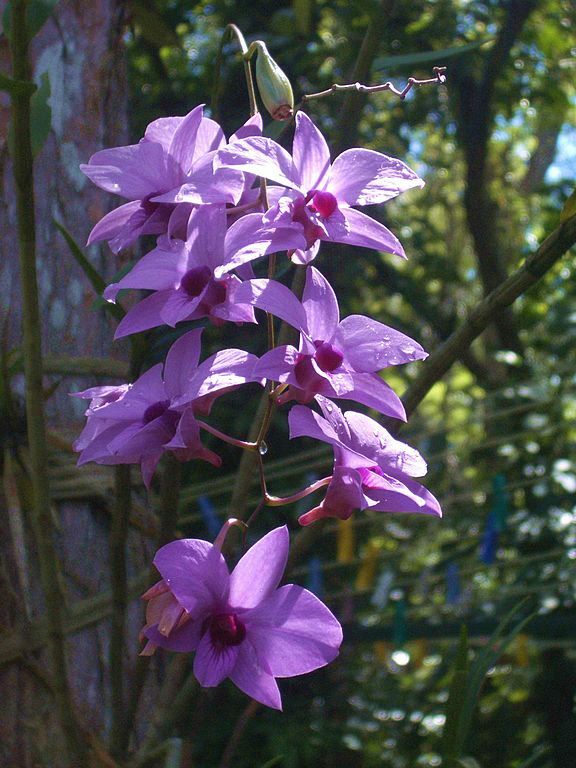 For example, recent genetic research has unveiled “Chromosome Homology in the Ceratobium, Phalaenanthe, and Latourea Sections of the Genus Dendrobium”. As a result, the classification of this orchid ‘complex’ is still in a state of flux as the cog of scientific discoveries and identifications continues to turn. Adding to the uncertainty and scope of the ‘complex’ is that even the origin or providence of the registered plant(s) can be called into question. While studies of molecular phylogeny have resulted in substantial reclassifications, whether this new scheme will be widely adopted is uncertain. As with many plants, both natural or artificial hybridizations within the “Cookie” complex can heavily confound cladistic analyses, even though the exact extent cannot be ascertained. At present this orchid is still recognised as Dendrobium bigibbum. Plants of the varieties of Dendrobium bigibbum exhibited are difficult to differentiate. It would be a brave person to be certain at monthly meetings or shows. The consequences of acceptance of Vappodes would result in the hybrids in this breeding group of Dendrobium being split into 6 nothogenera (hybrid genera). There are splitters and lumpers. The scientists are continually working on orchids but we do not have to change the names every time they print a report. I am told that there are more papers in the pipeline which may change things again. … yes den. phalaenopsis is recognised. However unless we have the providence proving the origins of the plant it is better to treat them all as Dendrobium bigibbum complex. The RHS register has two problems 1. The registered parent is what the breeder thought it was at the time. 2. There has been a history of name changes between phalaenopsis and bigibbum alternating over the years. So who knows what was really used? The more research I do the less comfortable I am at differentiating between the cultivated varieties of bigibbum and between the species and the hybrids. … Some reports say that the DNA is pointing to putting the bigibbum complex into Ceratobium. They breed readily in the wild with a number of natural hybrids. At present there is no agreement amongst the taxonomists on the breakdown of Dendrobium and I have had a conversation with some of the taxonomists which leads me to believe that the current splitters breakdown is not supported by any taxonomists. We are yet to see the papers published. Therefore, there is clearly the need to continue to consolidate available facts and opinions to reflect the latest consensus as well as divergence. On the whole, periodic expeditions into the taxonomical terrains and genetic makeups of the Dendrobiums in general and the bigibbum complex in particular seem to have revealed more questions than answers, and more intrigues than certainties. 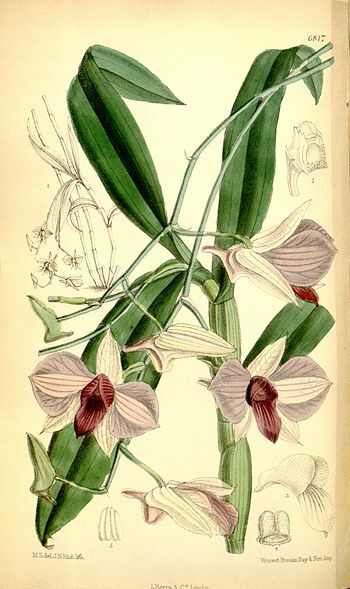 The Cooktown Orchid or Dendrobium bigibbum is ultimately a variable species with many subspecies and varieties found in not only north-eastern Queensland (from Johnston River near Innisfail south of Cairns to Iron Range in the Cape York Peninsula) but also the Tanimbar Islands, the Torres Strait Islands and New Guinea. Flower colours can be purple, rosy, mauve, white, white-spotted, or bicoloured, and the size can range from three to seven centimetres across the petals. Each raceme carries about 20 long-lasting flowers. 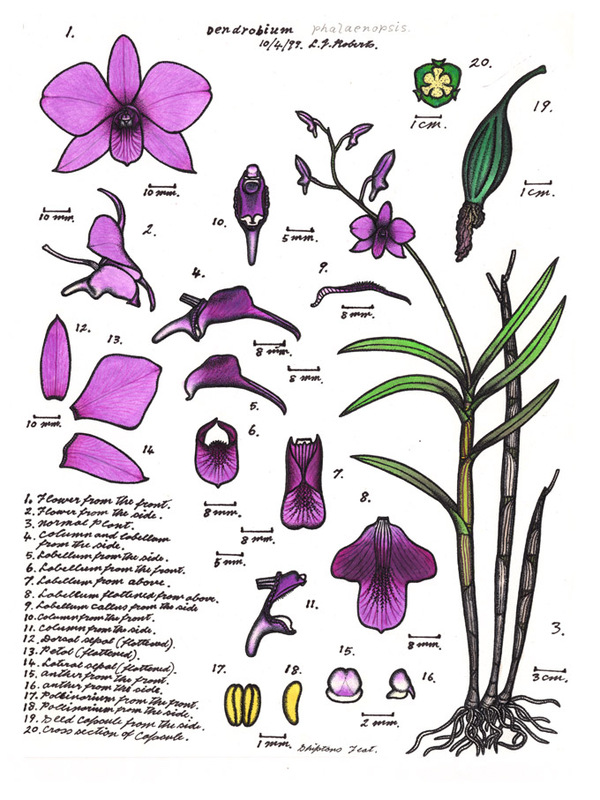 Whilst there are always going to be disagreements as to the taxonomic status of some species and genera, if you find more information and additional developments (whether definitive or provisional) regarding the Cooktown Orchid or the Dendrobium bigibbum complex, please kindly share them in the comment box below. Thank you in anticipation. More will be added and/or amended as we beat and dance to the ever changing rhythms of taxonomy, genetics and evolutionary biology. Plants of Dendrobium bigibbum were first collected by a Dr Thomson on Mount Adolphus, a small island about 18 km north-east of Cape York. These plants were sent to a nursery in London, and in 1852 the species was described and named by the British botanist, John Lindley (1799-1865). It does not occur near Cooktown. Dendrobium phalaenopsis was described by Robert FitzGerald, Surveyor General of New South Wales in 1880. In his description he included the words “It was obtained near Cooktown, Queensland”. 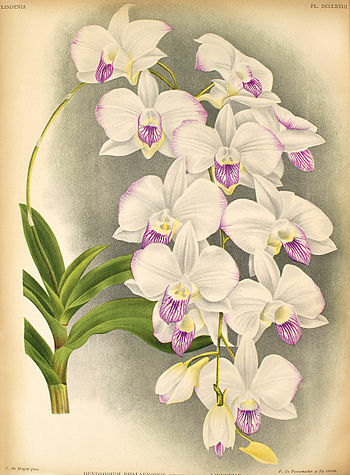 In December of the same year he published a beautiful colour plate of Dendrobium phalaenopsis in ‘Australian Orchids’ with the words “obtained in northern Queensland”, which clearly illustrates the plant people now know as the Cooktown Orchid. Apart from the fact that both the botanical name and the place of origin of the Cooktown Orchid are yet to be fixed for all time, or to be accorded with unswerving certainty, it is also unclear as to precisely when and where the common name Cooktown Orchid was first coined by whom. 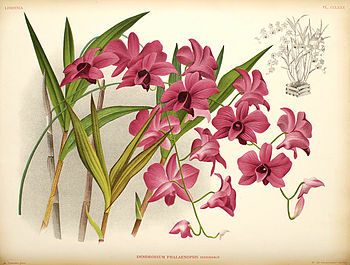 Nevertheless, the nomination and eventual ascendency of the Cooktown Orchid as a floral emblem began in the middle of the 20th century, when the profile of the species was bolstered in 1957 by the inaugural autumn exhibition of the Queensland Orchid Society (founded in 1934), which had already adopted Dendrobium bigibbum var. superbum as the emblem of the society. 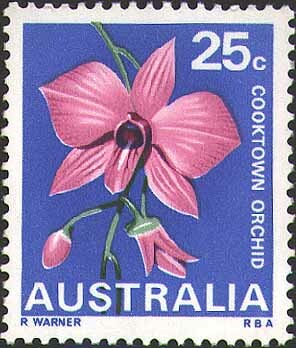 The prominence of the species was also boosted by the public discourse on the subject of floral emblem for Queensland via the mass media throughout 1958, as the state government sought advice on native species suitable as a floral emblem to prepare Queensland for its centenary in 1959. The process culminated in the Cooktown Orchid being officially proclaimed as the floral emblem under the botanical name Dendrobium bigibbum var. phalaenopsis on 19 November 1959, during celebrations to mark the Queensland’s centenary. In 1957 on Wednesday 10th and Thursday 11th of April, the Queensland Orchid Society held its first Autumn Show, the purpose being to publicise its emblem the Dendrobium bigibbum var. superbum (Cooktown Orchid). The admission to this show was one shilling (ten cents). 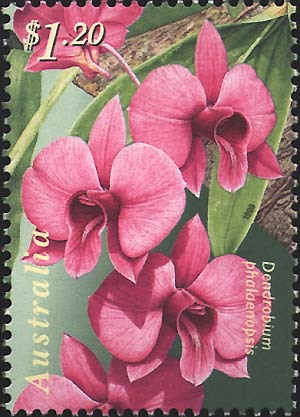 In 1958 there was much discussion in the media on a Floral Emblem for Queensland, so the Queensland Orchid Society started to move in support of Dendrobium bigibbum var. superbum as the floral emblem of Queensland. In June 1959 we were very pleased to see the “Cookie”, as it is affectionately known, become the floral emblem of Queensland. 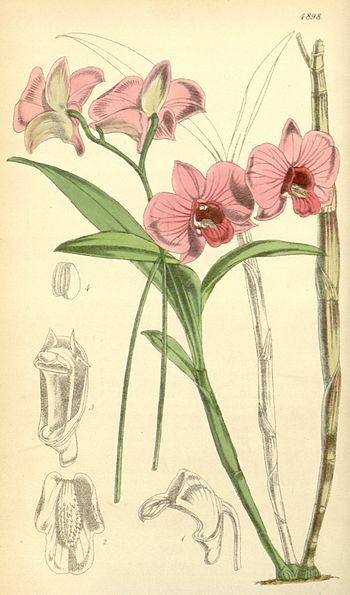 Even though floral beauty and ease of cultivation have contributed to the early discovery and wide distribution of the Cooktown Orchid, and to the long history and connection of the orchid with British botany and colonial township since the middle of the 19th century, being designated as a floral emblem in the middle of the 20th century is probably the biggest factor in the popularization of the Cooktown Orchid. Regarded as one of the showiest orchid species from Australia, the Cooktown orchid has been successfully cultivated in heated glasshouses in England since the latter part of the 19th century. Given the resemblance of its flower to that of Phalaenopsis, it was first described in 1880 as Dendrobium phalaenopsis, then included in Dendrobium bigibbum. Chosen amongst other candidates that included Red Silky Oak (Grevillea banksii), Umbrella Tree (Brassaia (now Schefflera) actinophylla), and Wheel of Fire (Stenocarpus sinuatus), the Cooktown orchid was proclaimed to be the floral emblem of Queensland in 19 November 1959, as it “conformed with the Government’s criteria in being an easily cultivated native species confined to Queensland, decorative and distinctive in appearance, and coloured close to the State colour, maroon”, according to Anne Boden, writing for a booklet published by the Australian Government Publishing Service (AGPS) for the Australian National Botanic Gardens (ANBG) in 1985. Barely four decades later, and at the beginning of a new millennium, the botanical name of the Cooktown orchid was changed as a result of reclassification at the level of genus. Since Vappodes (a genus of orchids from Indonesia, New Guinea and Australia) was separated from Dendrobium in 2002, Vappodes bigibba is accepted as the correct name for Dendrobium bigibbum in the Australian Plant Census and by the Australian Government’s Department of the Environment, Water, Heritage and the Arts. Dendrobium bigibbum, Dendrobium phalaenopsis and Vappodes phalaenopsis (Cooktown Orchid) are represented by the Legal Status and Documents contained in the SPRAT Profile (Species Profile and Threats Database) under both the older taxon id 10306 for Dendrobium bigibbum and the newer taxon id 78894 for Vappodes phalaenopsis within the Threatened Species & Ecological Communities of the Biodiversity division at the Department of the Environment of the Australian Government. One of the Documents available in the SPRAT Profile is the Commonwealth Conservation Advice on Vappodes phalaenopsis from the Threatened Species Scientific Committee. The advice includes existing plans, records and management prescriptions, listing the species’ Description, Conservation Status, Distribution and Habitat, Threats, Research Priorities, Regional and Local Priority Actions, Existing Plans/Management Prescriptions that are Relevant to the Species, and Information Sources. 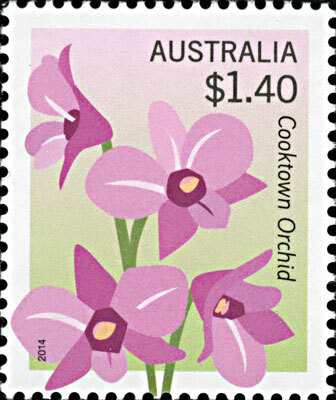 The Cooktown Orchid was commemorated on the 25-cent stamp on 10 July 1968, the $1.20 stamp on 6 August 1998, and the $1.40 stamp on 24 March 2014, the latest of which nearly coincides with the 80th Anniversary of the Queensland Orchid Society, held exactly two months earlier on 24 January 2014. Plants are up to 80 cm in height, comprising 3-20 flowering canes up to 1.5 cm in diameter. Three to six lance-shaped leaves, 5-12 cm long, are arranged on the upper parts of the pseudobulbs. The stems bearing the flowers are 10 to 40 cm long, carrying up to 20 flowers. Each flower is about 3 to 6 cm wide and usually coloured deep to pale lilac, or rarely white. It usually flowers in the dry season in the wild, but may flower throughout the year in cultivation. It occurs naturally in northern Queensland, from Johnston River to Iron Range. Although it is found in tropical districts with very high summer rainfall, it is not a rainforest species but grows in exposed situations, usually attached to tree trunks such as paperbark melaleucas in savanah woodland or in vine thickets. Habitat alteration and indiscriminate harvesting by some commercial plant collectors have made this species rare or extinct in some places within its range, especially in the southern part. 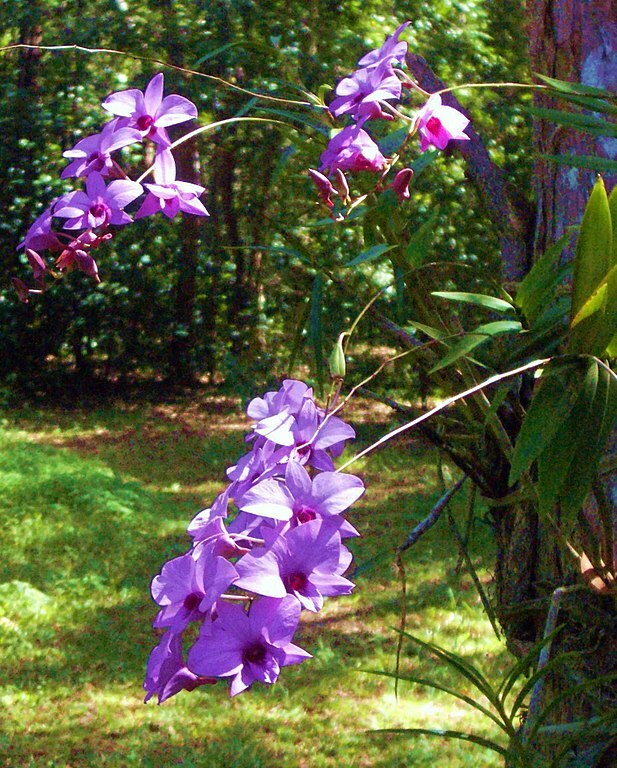 Cooktown Orchids may be propagated from seed by commercial orchid laboratories, or mature plants may be divided at any time. As far south as Brisbane it is suitable for outdoor cultivation attached by wire or twine to the sunny eastern or northern side of a tree with persistent bark. Until the roots become fully established on the bark surface, they should be protected by a piece of hessian to avoid drying. A slab of cork provides a satisfactory alternative to cultivation on living bark. It may also be grown in pots or baskets, using fern fibre as a growing medium over a deep layer of broken crocks to provide effective drainage. South of Brisbane, glasshouse cultivation is necessary using pots or cork slabs. Generous watering must be provided during summer when growth is active. Winter watering is required only to avoid shrivelling, otherwise the plant is liable to decay and leaf-drop. Light applications of organic or artificial fertiliser during summer improve the number and size of flowers. It is an ideal cut flower in autumn and winter, lasting up to two weeks in water, especially if pollination has not occurred. Flower-spikes can last up to three months, giving the species considerable commercial potential as an indoor flowering plant suitable for warm well lit rooms. Variations in the size and colour of flowers and the size of pseudobulbs have been noted. Several varieties have been described but these represent the extremes of a continuously varying range of shapes and colours of the flowers. 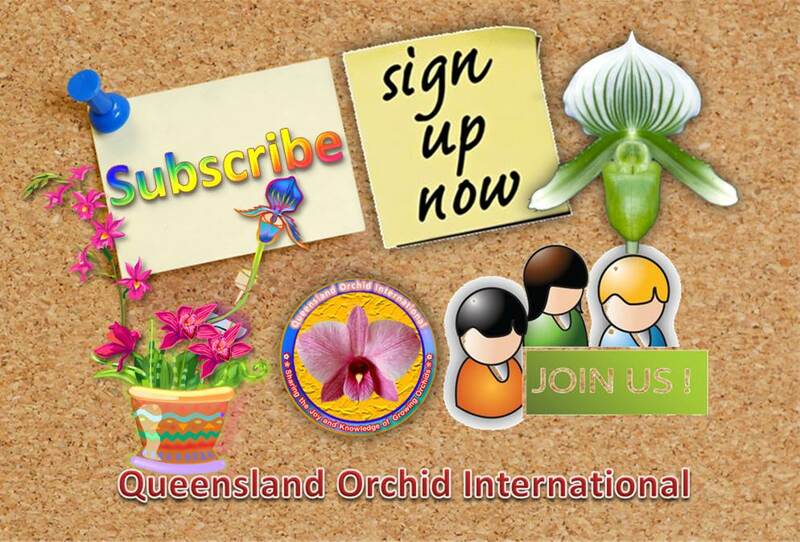 Excellent or exceptional photos and videos uploaded to the group may be featured in the following Gallery of this post to provide exemplary visual documentations of the Cooktown Orchid (Dendrobium bigibbum, Dendrobium phalaenopsis or Vappodes phalaenopsis). Barbara Haywood: My husband Max’s favourites! These are wonderful Australian Native Dendrobium Species Orchids. They come into their own in Autumn. We have only a few but would like some different colours. These two came out of a Compot we were able to obtain 6 years ago from Tinonee Orchids. B. Some fresh air you say ? , that sounds Devine . I’ve given some thought to your article & it is my observation that humans are very reticent to change . Maybe with the way computer are humans will become more adept at embracing updates & new scientific data as science produces it rather than having knee jerk reactions & pushing change away .Certainly it is food for thought & worth thinking about .By the way did I mention how enjoyable your writing style was ? The night air is a little crisp , hmmm that is cosier Thank You Sweetheart………..
Shall we dance to the ever changing beats and rhythms of taxonomy, genetics and evolutionary biology? 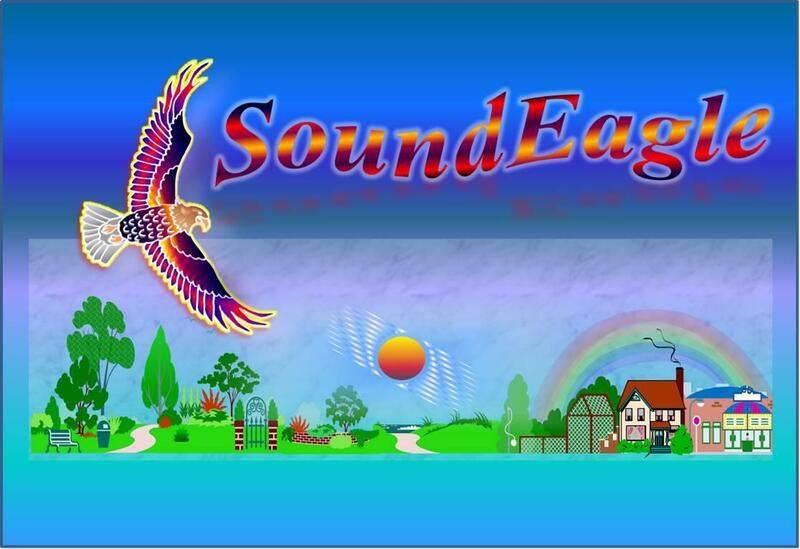 Certainly, provided you could indeed cope with cross-rhythms, asymmetrical measures and odd time signatures as well as tonal indeterminacies, contrapuntal irregularities and harmonic dissonances. That is how one can sometimes describe, in musical analogies, the processes and outcomes of comparative biological studies, molecular phylogenetics, phylogeographic history, and interpretations of morphological evolution, all of which can be as taxing (or vexing) as certain human inertia presenting resistance to (the acceptance and application of) some new paradigms or fundamental changes.